When I'm not writing, reading or marketing works of fiction, one of my favorite jobs is grounded in a challenging reality: Helping high school seniors through the college application process. In my experience, regardless of his or her academic, athletic or extracurricular profile, every student arrives at my door with eyes full of panic. 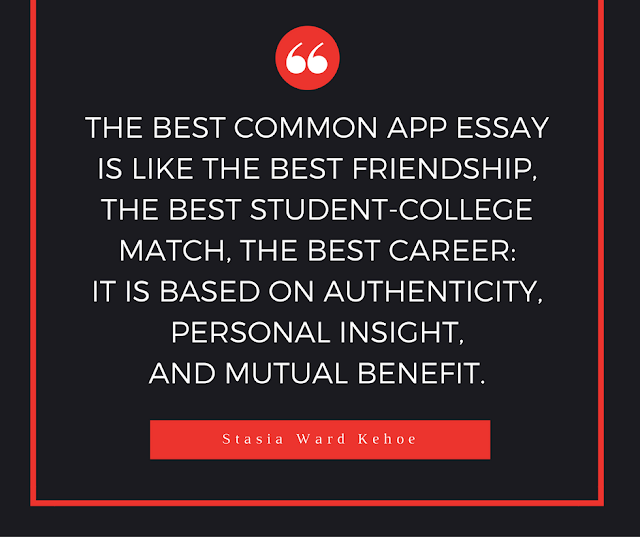 And, many kids tell me that the scariest part of the process is writing the dreaded ESSAY (Common App or school-specific). I believe that, if approached correctly, working through the components of a college application helps a student reach a deeper understanding of his or her talents, goals and needs. In this way, the pedagogy of the application drives toward identification of a compelling topic (often a key challenge for students), and a successful essay. This, in turn, gives a student a sense of satisfaction with the self-portrait painted in the application, a sense of agency in what can be a very disenfranchising process, and ultimately a satisfying acceptance outcome. I believe this is a good tip for personal essay writing in any situation.